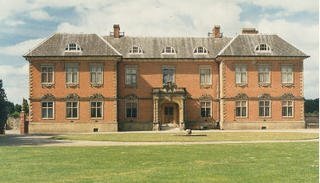 It is that time of the year again, when Tredegar House, after a winter of apparent slumber (in reality it has been a remarkably hectic close season) re-opens its doors to the public. Visitors to the House will see some noticeable differences: the stairwell has been repainted and is now resplendent in Indian Yellow. It certainly brightens up that portion of the House. A new family portrait is now added to the walls at the top of the staircase, that of Thomas Morgan of Machen, a late 16th, early 17th century Morgan, who played a large part in the tale of the dynasty. Also, newly hung portraits of Sir Charles Morgan and his son, Sir Charles Morgan Robinson Morgan (the 1st Baron Tredegar) are now alongside those of their ancestors and descendants. The Best Chamber has been completely re-painted as well. It is now 'Tallow', which is an off-white with a slight yellow tint.